What does the Envoy ESTEEM look like? How Does the ESTEEM work? Do I have to wear anything in my ear or behind my ear if I have an ESTEEM implant? Will I still have to hassle with a hearing aid? If the ESTEEM is totally implanted, how do I control the device? Change the volume, etc.? How long does the ESTEEM battery last? What happens when the Sound Processor battery becomes depleted? When the battery is replaced, do I have to have the same type of procedure that was used for my initial implant? May I have an MRI scan after having an ESTEEM implant? May I have a CT scan after having an ESTEEM implant? How Many People Have Had an ESTEEM™ Device Implanted? What Surgical Procedure is used to Implant the ESTEEM™? Drs. Kraus was proud to be among a small group of ESTEEM® implant surgeons in the United States. He was one of three original surgeons who helped to develop the current ESTEEM surgical technique. "beyond hearing aids but before cochlear implants". The ESTEEM received FDA approval on March 17, 2010. The ESTEEM received CE Mark clearance for implantation in Europe in 2006. Sensorineural hearing loss (SNHL) is a condition in which the nerve cells within the inner ear (cochlea) do not work properly. The ear has three major parts: (1) the outer ear for gathering sound, (2) the middle ear for transmission of sound from air to mechanical motion (hearing bone vibration), and (3) the fluid-filled inner ear for changing sound into signals that are sent to the brain to be interpreted as meaningful sound. Conditions that may cause SNHL include: complex genetics (congenital, familial non-syndromic or syndromic), noise exposure, infection, trauma, neoplasms, degenerative forces, vasculitis, auto-immune disorders, metabolic abnormalities, ototoxic exposure, and inner ear malformations. Hearing loss may be gradual and progressive or may occur suddenly without warning. Patients tolerate these inconveniences because they have had no other choice. In many situations, their jobs depend on their ability to hear. But, even with the best hearing aids and the best fit, many patients simply do not feel normal. More than 20 years ago, a team of highly skilled engineers began to develop a new totally implantable, active middle ear device, the Envoy ESTEEM, to treat moderate-to-severe SNHL. Their ingenious efforts, along with a dedicated group of ear surgeons who helped to develop the surgical refinements needed to implant the device, led to FDA approval of the Envoy ESTEEM hearing implant on March 17, 2010, after six years of clinical trials. Dr. Eric M. Kraus (The Ear Center of Greensboro, P.A. ), Dr. Jack A. Shohet (Shohet Ear Clinic), and Dr. Peter J. Catalano (while at the Lahey Clinic) played instrumental roles in providing surgical consultation, leadership as co-investigators in the clinical trials to evaluate the device and surgical technique to implant them, and the initiation of genuinely new and innovative techniques for implanting active middle ear devices as well as reversing implants when necessary. The results? Patients from all walks of life and professions have traveled to The Ear Center of Greensboro, P.A. for their ESTEEM implants. Among his ESTEEM patients are: two physicians, two attorneys, a dentist, multiple engineers, a physicist, a pharmaceutical representative, a rancher, a truck builder, an oil rigger, an IT consultant, grandmothers, grandfathers, mothers, fathers, sons, and daughters. Beginning in 2004, Dr. Kraus was one of three co-investigators participating in the ESTEEM Pivotal Research Trial that ultimately led to FDA approval in March, 2010. Dr. Kraus implanted the first patient in the U.S. with a first generation ESTEEM I implant in June, 2004. Since that time, Dr. Kraus has implanted 43 patients from around the U.S., including 23 patients implanted with the second generation ESTEEM. Battery replacement procedures have also been performed. In addition to participating in U.S. FDA Pivotal Trials 0203 and 0204, Dr. Kraus has trained ESTEEM surgeons, beginning in 2004 from around the world, including surgeons from: England, France, Germany, Italy, Spain, Belgium, Israel, Egypt, Syria, Lebanon, Dubai, Saudi Arabia, South Africa, and Brazil. Dr. Kraus has presented scientific papers concerning the ESTEEM around the world - Marseille, France; San Diego, CA; London, England; Vail, Colorado, Irvine, CA; and Chapel Hill, NC. On December 18, 2009, he was one of three ESTEEM surgeons to present at the FDA ENT Advisory Panel meeting that resulted in a 15-0 unanimous recommendation for FDA approval. In 2007, Dr. Kraus invented the Kraus K-Helix Crown and Piston middle ear prostheses that are used for the surgical reconstruction of the hearing bones (ossicular chain reconstruction). These novel titanium prostheses have been used successfully in the rare occasion when it is necessary to reverse the ESTEEM implant. Hearing in such patients has been restored to baseline pre-implant levels. Since 2008, the Kraus K-Helix prostheses have been successfully used around the world to help many patients who suffer from chronic ear disease. Dr. Kraus has trained surgeons in K-Helix implantation from the U.S., France, Germany, and Belgium. Along with ESTEEM implants, The Ear Center specializes in computer programming of the ESTEEM by a team of experienced, highly trained audiologists One of our research audiologists has programmed more ESTEEM implants than any audiologist in the U.S.
"The Ear Center of Greensboro continues to be on the very leading edge of hearing implant surgery for hearing restoration in the U.S.", explained otologic surgeon, Eric M. Kraus, M.D. "Here you will find very experienced surgeons who understand the engineering as well as the medicine and surgery of implantable hearing devices. Through our experience, we are providing innovative insights for the design of the next generation of active middle ear devices. Through our surgical skill, we are helping patients with significant hearing loss to hear better again and to feel normal again". Our motto: "Good judgment comes from experience. And, experience come from bad judgment." who have performed ESTEEM implants for physicians, attorneys, dentist, engineers, physicists, etc. and who understand all of the ramifications of being significantly hearing impaired. For more information, please contact our Audiology Department at 336-273-9932.
a Driver-PZT transducer that vibrates the stapes. Black arrows indicate the pathway that sensed sound energy travels through the ESTEEM™ system. The second (incus) and third (stapes) hearing bones are separated from each other during the implant procedure in order to prevent feedback vibrations. The ESTEEM has no external hardware to wear. Everything is implanted. The ear canal is not occluded. The ESTEEM is completely invisible to others. There is no constant changing or recharging of batteries. Audiologist control and programming of the ESTEEM™ are achieved through transcutaneous telemetry. Patients control their ESTEEM with a Personal Programmer that looks like an iPod. The totally implanted ESTEEM™ Device is composed of two piezoelectric bimorph crystals connected to a Sound Processor (contains electronics and the battery source). One piezoelectric crystal, the Sensor, is interfaced to the second hearing bone (the incus). The Sensor serves, in conjunction with the patient's native eardrum (tympanic membrane), as a "semi-biologic" microphone. The eardrum serves as the "diaphragm" of the microphone. The Sensor generates its own power. The second piezoelectric crystal, the Driver, is coupled, through a facial recess tympanomastoidectomy surgical approach (bone behind the ear), to the third hearing bone (the stapes). During the surgical procedure, the incus is separated from the stapes to prevent feedback vibrations. Sound signals enter the ear canal and vibrate the eardrum and incus. The vibrations are then "sensed" from the incus by the Sensor . The sound signal is then "relayed" to the implanted Sound Processor to be amplified and processed. The processed signal is "relayed" to the Driver that is coupled to the third hearing bone, the stapes. The stapes vibrates fluid within the inner ear (the cochlea). The fluid vibrations cause tiny hair cells within the cochlear to send neural signals to the brain that result in the sense of hearing. Because the ESTEEM™ is totally implanted, the patient does not wear any external hardware. None! The ESTEEM™ is totally invisible. Nothing is worn in the ear canal or behind the ear. The ear canal is completely open. There are no ear molds. Hearing while bathing, swimming, and all active water sports is possible. There are no external components to remove.. Patients may leave their ESTEEM™ device turned on 24/7 just like their natural ear. No more hearing aid hassles. None! No more fumbling around in the dark at night to find your hearing aid. No more embarrassing situations when your hearing aid batteries suddenly die at the most inopportune time.. No more ear canal infections from hearing aid molds. No more occlusion effect from a hearing aid blocking your ear canal. No more broken battery doors, cracked tubing, and ear wax blocking the microphone. No more hearing aid repairs and replacements. No more lost hearing aids when you jump into the water without removing your aids or inadvertently send the hearing aid to the dry cleaners in your shirt pocket. No more hearing aid batteries...period. No more hearing aid hassles. In addition to the patient's ability to control their ESTEEM™, the implanted Sound Processor is totally computer programmable by our audiologists using special Commander Software. The Sound Processor can be reprogrammed at any time. Power for the ESTEEM ™ Sound Processor is provided by a non-rechargeable battery that is hermetically sealed within the Sound Processor. Patients never have to change batteries or charge batteries. Battery life of the ESTEEM™ II Sound Processor is 4.5 - 9 years depending on individual power requirements. In the worst case scenario,listening to continuous 90 dB sound for 24/7 results in a battery life of 2.8 years. Most patients will enjoy longer battery life. Two months before the battery becomes depleted, the patient will hear two brief tones when turning on their ESTEEM. The two tones are a signal from the device that its battery has 2 months of battery life left and that the patient should contact his surgeon to schedule a battery change. When the battery eventually becomes depleted, the combined Sound Processor/Battery unit is explanted and a new unit is implanted. When a battery replacement is performed, the patient automatically receives an updated, latest generation Sound Processor along with a new, fully charged battery, as permitted by regulation. Battery replacement is an outpatient procedure. Battery replacement is a much more limited procedure and is usually performed in the morning at an ambulatory surgery center under local anesthesia with sedation. The sedation is similar to what is used during a colonoscopy procedure. The procedure itself is similar to having a cardiac pacemaker battery replaced. The procedure takes approximately 45 minutes and is performed through the same behind-the-ear incision (although the incision is more limited) that was used for the initial implant. Only the Sound Processor/Battery is replaced. Original transducers and leads are left in place because they are backward compatible. Reprogramming of the new Sound Processor and Personal Programmer are performed at The Ear Center, usually in the afternoon, on the same day that the battery is replaced. Sutures are removed seven to ten days after the procedure. The current generation of ESTEEM™ device is not MRI compatible. ESTEEM patients should not undergo magnetic resonance imaging of any kind. MRI scanning involving exposure to strong magnetic fields. If you have been told that you need an MRI scan, please call your ESTEEM surgeon. Yes. CT scanning (involving conventional x-ray irradiation) is permitted after having an ESTEEM implant. Standard x-ray tests are also permitted. The first generation Esteem™ Clinical Trial was performed from 2004-2006. A total of seventy-two (72) participants were implanted. The second generation Esteem™ Clinical Trial began in 2008. A total of fifty-seven (57) participants have been implanted. Several additional patients have been implanted in a trial extension. Of the 72 first generation implants in the USA, 20 patients were implanted in Greensboro. Of the 57 second generation implants, 22 patients were implanted in Greensboro. Approximately 100 European patients have had the Esteem™ device implanted. 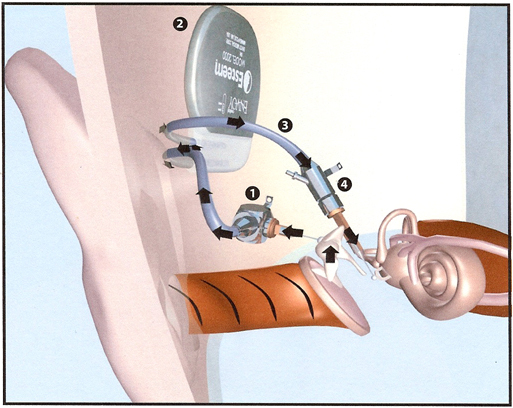 The ESTEEM™ device is implanted behind the ear and in the middle ear space during a 3-4 hours surgical procedure. The operation is performed under general anesthesia at an ambulatory surgery center, the SCA Surgical Center of Greensboro, Greensboro, NC. The Surgical Center is located five blocks from our office. Our experienced operating room team has been specifically trained in implantable device technology during the past six years. Usually, patients are observed for 23 hours overnight and are discharged the next morning. One loved one may stay with you overnight at the SCA Surgical Center of Greensboro. Further details concerning the operative procedure will be explained during your initial visit. To learn more the ESTEEM, please visit our ESTEEM web pages.